The new station will be constructed just west of Highway 27, about two kilometres north of Dixon Road. Metrolinx has partnered with a private company to build a new GO Transit station next to Woodbine Racetrack in Etobicoke, the regional transit authority announced Wednesday. The station will be constructed just west of Highway 27, about two kilometres north of Dixon Road, on the Kitchener line. Given its location, the stop will be called Highway 27-Woodbine. Woodbine Entertainment Group, the corporation that owns and operates the racetrack, will be responsible for its design and construction. The company will also cover the capital costs, estimated to be between $75 million and $90 million. Details of the station were revealed by Transportation Minister Jeff Yurek, Metrolinx CEO Phil Verster and Woodbine Entertainment Group CEO Jim Lawson at a news conference at the racetrack. Yurek told reporters that the project will be built with no cost to Ontario taxpayers. 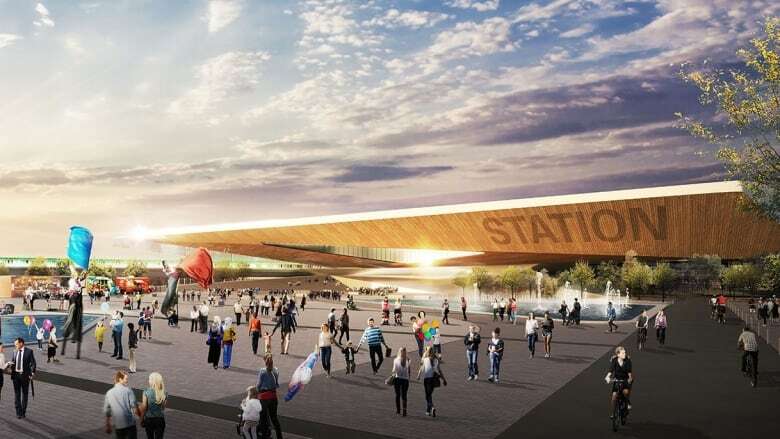 The planned work is part of a years-long GO service expansion that will also see Etobicoke North station, located just a few kilometres to the east, torn down. According to Metrolinx, some 625 GO riders consider Etobicoke North their "home station." Of those, about 71 per cent drive to the station and park. The new Highway 27-Woodbine station is expected to accommodate those customers, as well as new ridership generated from a planned "entertainment complex" on the 700-acre Woodbine Racetrack grounds that will include a bigger casino, retail spaces, a concert venue, restaurants, office space and two hotels. Lawson said the company will begin "immediately" procuring a contractor to begin construction. According to a report published by Metrolinx in November 2018, the station will have 790 parking spots, a pick-up and drop-off lot with space for 45 vehicles and a bus loop with enough space for four buses. "Given the low densities of the surrounding area and the predominantly industrial land uses, it has been assumed that the majority of station users will arrive either by car or by transfers from other public transit routes," the Metrolinx report said. Metrolinx notes that Humber College, University of Guelph at Humber and Etobicoke General Hospital are all within a 3.3-kilometres radius of the site of the new station. Metrolinx also says that the station could be used to connect "several existing and proposed rapid transit services, including the UP Express and a potential future Finch West LRT extension."